I've had an idea bouncing around in my head for a while - it all started when I was talking to my good friend Anthony about possible uses for his Echoplex project, specifically the collaborative coding section. I had been performing interviews for UI related positions at UXP Systems for a while at that point, and screening candidates was always time consuming and somewhat unreliable. 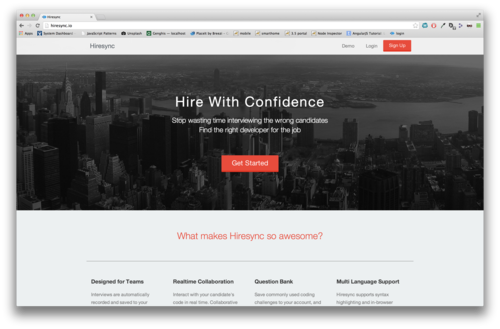 The two came together and the idea for Hiresync was born - in-browser collaborative coding, where the sessions are recorded for you or your teams' later review. I do feel a sense of validation for the idea as it seems several other startups have sprung up recently based on the same premise, including InterviewStreet's own CodePair. Fortunately I've got some features up my sleeve which should help Hiresync stand out from the rest. Standard disclaimer: it's still pretty early, and alot of features haven't been implemented. Expect regular updates.